I have had this ring for quite a while. The trademarks on the band have been giving me fits! I still cannot make out exactly what it says but I can see an Eagle mark 3. I know this is a generic mark for some Mexican sterling. I believe I see an "S" and a "C". There are additional markings that I cannot decipher. 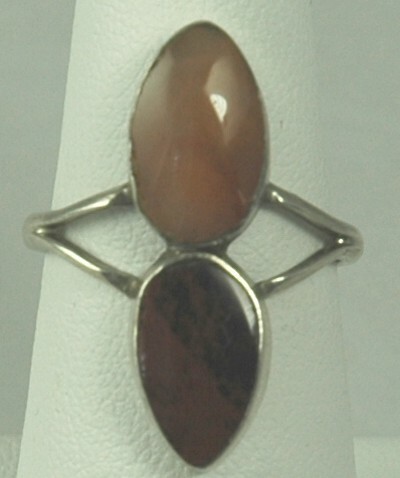 The ring is a size 6 1/2 and has two agate stones set one atop the other. It looks handmade. Condition: Excellent vintage. I did not polish the ring. It can be polished upon request. It has normal silver patina. Measurements: 6 1/2". Stones are tapered, but are 8mm across the middle.